The game brings a campaign mode, but the story seems more of a narrative to build the gameplay and characters around, rather than taking you on an enchanted fairy tale. Of course the game does give you a storyline to follow, to make you feel like you are doing all this for reason. In the game you are going to informed by the disembodied voice of Aurelius, that your world is all but lost. It is now your job to do all you can to save Meliora from the evil that has awoken. As you’re an all-powerful Wizard in order to try to save your world, you are going to have to use all your spells to complete this epic journey. This is where the main gameplay element comes into play… the spell-casting. You will need to master six spells in total and what The Wizards does is makes you feel like this all-powerful wizard, by making the casting done by physical movements. The spells are all linked to separate hand-gestures, which you will need to learn. Which really brings an outstanding level of immersion in the game. As you start of the game you can cast a fireball, spawn a shield and make an ice bow and arrow. Then as you move through the worlds you will learn the remaining spells – these are a two-handed lightening attack, a large explosive fire-orb and my favourite an arcane shard spell. Now, I know you might thinking are six spells enough for the entirety of the game? I personally think the team at Carbon Studio got the amount perfect, as you are not over-loaded with spell gestures to remember. Aurelius comes back into the game when it comes to the spell-casting, as he is basically your tutor. So, when you learn the spells and how to cast them his voice will guide you. These spells come into use with a wave based combat system, with areas becoming sealed off until all the enemies are taken care of. 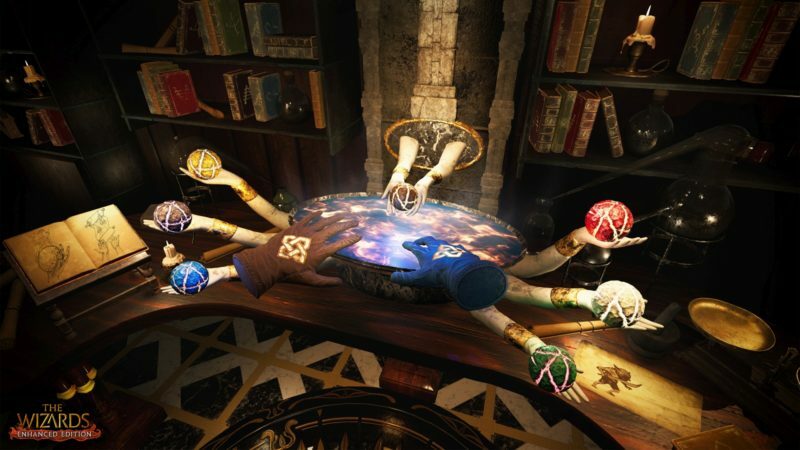 Some people might feel this is not the best way to go and one that is over-used in VR games, but I think it was the perfect for the way The Wizards plays out, and it gives the spell casting system a chance to shine. Aurelius comes into the game again for the final element of the gameplay. Around the world you will find his Fate Cards. Upon finding these cards they will be selectable before entering the worlds. You can select two of these cards at a time (as long as they are compatible with each other), which will give you different buffs for the playthrough of that level. The immersion brought with the spell-casting is kept in the game by the solid presentation in the worlds you are visiting. Each area of this world you visit from the quiet village to the catacombs and desert ruins, all these environments look great never mind the setting you are in. Each part of each levels are made up with good quality textures that brings some great detailing. Adding into the this the well designed enemies with great models and it’s hard to be dragged out of the world the team have created. This is then cemented with strong use of the audio design, that makes sure you ears are just as happy as your eyes. With worlds being brought together by the environmental sounds and music. Then add in the strong voice work by Jason Marnocha as Aurelius, who manages to bring the character of Aurelius to life, even though you only hear his voice. The game can be played either seated or standing, but if you can I would recommend standing for the game. 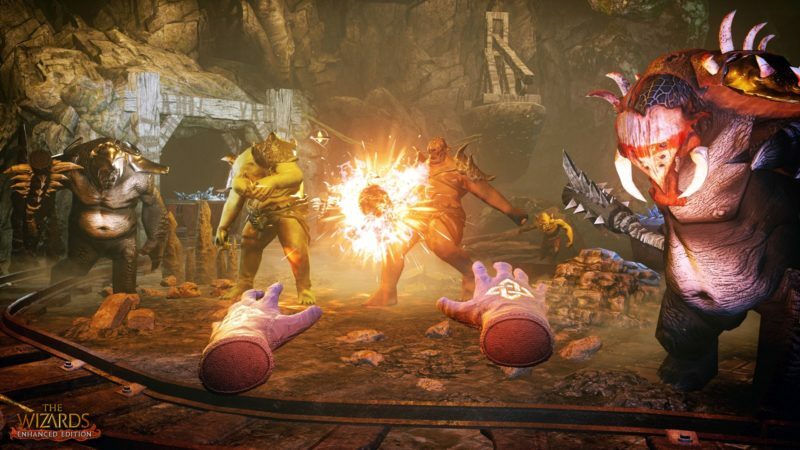 With the way the spell-casting works you will be required to play the game with the two Move controllers, as you need to trace the hand-movement needed in order to cast each spell. With the hardware limitations of always needing to be front facing the team have implemented a similar control scheme to Skyrim VR, which is perfect for PlayStation VR with the Move controllers. The team have also implemented a lot of comfort options, allowing for teleport movement and a mix of free and teleport movements. When it comes to the free movement you will also have a number of comfort options like movement speed, blinders and snap turning. All of these options really makes the game accessible to everyone, never mind the strength of their VR legs. The game brings with it a huge amount of gameplay time, with the way the team have approached it. Firstly in the Enhanced Edition the campaign took just over fives hours to complete. Then you can revisit these levels with different fate cards to change your buffs and how you approach each level, which will also need you find the Fate Cards. As well as the Fate Cards you will also have three pieces of gem to find in each level, and also need to upgrade your spells – all this in the campaign mode. Then they have an Arena mode that brings the challenge of endless waves to survive, to bring a little extra reason to return. Both of these come with global and friend leader-boards, meaning you can lay down challenges to the world or your friends. 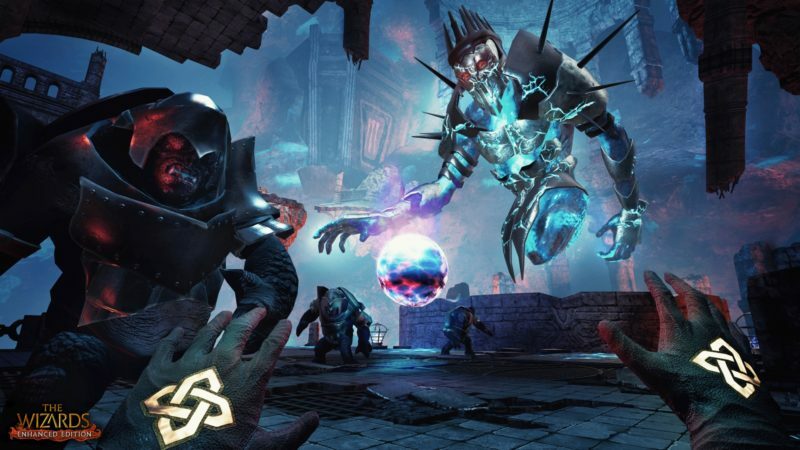 The Wizards: Enhanced Edition brings a really great title from PCVR over to PlayStation VR, with a very solid port. This is an experience like no other, as it will leave you feeling like an all-powerful wizard – something a lot of childhood dreams are made of. 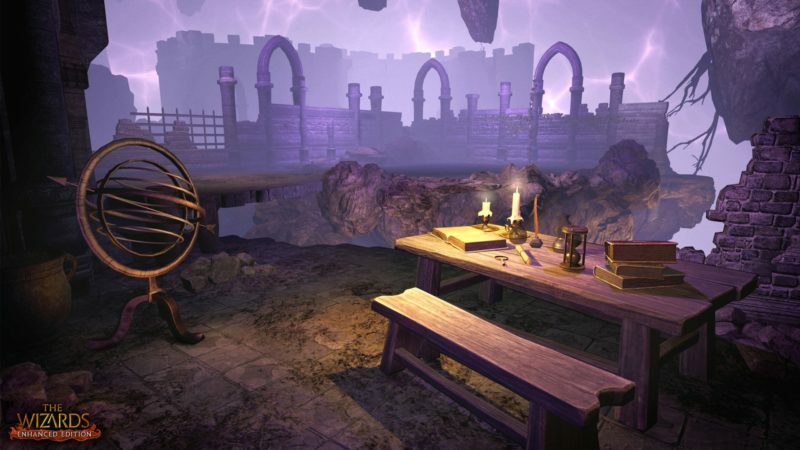 Every part of the game is strongly built and you will be immersed in the world of Meliora from start to finish. The spell-casting is something you will need to experience yourself, so make sure to grab this title, and become this all mighty spell-caster. 3DRudder support is also confirmed for an additional movement method, which will launch April 2019.